1. INTRODUCTION This report is Romanian Informative Inventory Report (IIR) regarding the national inventory submitted in February 2010. Romania signed the Convention on Long-Range Transboundary Air Pollution (CLRTAP) from 1979, transposed in national legislation by Law 271/2003 on CLRTAP and its protocols signed in Geneva on 13 November 1979, in Aarhus on 24 June 1998 and in Gothenburg on 1 December 1999. In this direction, annual estimated emissions of the atmospheric pollutants at national level are being realized within the framework of reporting obligations assumed by Romania. 1.1. Institutional arrangements: The inventory system currently used in Romania is presented in figure below. 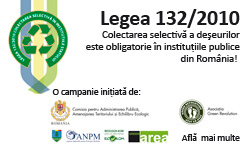 The National Environmental Protection Agency from Romania has the overall responsibility and submits the inventory report to CLRTAP. The methodology used in estimating and reporting emissions is according to the last version of the guidebook elaborated under the patronage of the Executive Committee of the CLRTAP, “EMEP/EEA air pollutant emission inventory guidebook- 2009”. The range of pollutants covered by this methodology guide is: SO2, NOx, NH3, NMVOC, CO, CO2, TSP, PM10, PM 2,5, heavy metals, (Cd, Pb, Hg, As, Cr, Cu, Ni, Se, Zn), POP (HCB, HCH, PCB, dioxins/furans), PAH. The input data was processed using the CollectER IIIapplications. The emissions obtained according to this database are used to complete the last version of the reporting formats requested by the UNECE/CRLTAP Secretariat. Road transport emissions were estimated using COPERT III and COPERT 4 was used for estimating the NMVOC emissions resulted from gasoline evaporation. There have been major differences from the last submissions as a result of using the new guidebook. This situation implied the recalculation of the 2007 emissions. For the former years the recalculations are currently in progress. The NFR Category - ENERGY represents the main source of emission in Romania. This sector has a share of about 95% of total SO2, 88% of total NOx and 93% of CO. The share of the other pollutants is presented in table 1. For estimation of emissions from the sources included in this category TIER 1 approaches were used except for some sources included in 1A2b and 1A2fi sectors, where TIER 2 approaches were used. Details about the level of approaches are presented in table 2. This activity covers combustion processes from production of electric power and thermal energy in public power and district heating. The emissions data reported annually under LCP Directive (2001/80/EC) are the basis for the estimating of the emissions for 1A1a. The type of fuel and the percentage of specific fuel consumption used to produce electric power and thermal energy were distributed according to the types and capacities of the boilers. To emissions data are taken from the LCP inventory. This inventory is compiled using data submitted by the refineries operators. In order to estimate emissions resulted from these types of activities, data provided by the NIS are taken into consideration (energy balance and industrial activity data). There are no national emission factors developed, so emission factors are those from the last version of the guidebook. This chapter covers combustion activities in industry, for the following source categories: Iron and Steel, Non-ferrous metals, Chemicals, Pulp,Paper and Print, Food processing, Beverages and Tobacco. The emissions resulted from iron and steel production have been counted starting from the data regarding the industrial activity and from the operators (these date are stored in databases, developed at county level, by the Local Environmental Protections Agencies). In this sector are included the following activities: production of mineral and glass wool (except binding),asphalt concrete plants, manufacturing bricks and tiles and. cement industry. Emissions from combustion in the chemicals sector (1.A.2.c – Chemicals), production of pulp and paper (1.A.2.d – Stationary combustion in manufacturing industries and construction: Pulp, Paper and Print)and food processing (1.A.2.e – Food processing, beverages and tobacco)are included (IE) in 1A2fi – TIER 1. Emissions from fuel combustion in road transportation were estimated using Copert III, taking into account the maximum sulphur content of fuels, based on current legislation. This was done because no studies regarding the characteristics of fuel sold by various distribution companies at national level have been carried out, and usage of year 2005 fuel sulphur content would have resulted in overestimated SOx emissions. Emissions for 2007 have also been recalculated. The sector includes emissions from passenger cars, light duty vehicles, heavy duty vehicles and busses, mopeds and motorcycles. Motorcycles with a capacity over 50cm3. The number of diesel passenger cars has increased by almost 60% since 2005, while the gasoline fueled ones recorded only a 16% increase. Annual fuel consumption was provided by the National Institute of Statistics. Total Diesel fuel sold quantity has increased by 28,5% from 2.121.728 tons in 2005 to 2.967.668 tons in 2008, while gasoline consumption has decreased by almost 6% during the same period. Regarding passenger cars, the number of diesel vehicles has increased by 60%, while the number of gasoline fueled ones has grown only by 16%. Compared to 2005, there has been a 75% decrease in SOx emissions. Acccording to national legislation, the maximum sulphur content in gasoline was set to 150 mg/kg as of January the 1st,2005 and further decreased to 50 mg/kg starting with the 1stof January 2007. Diesel fuel sulphur content was enforced to decrease from a regulated maximum of 350 mg/kg before January the 1st, 2007 to 50 mg/kg from the 1stof January 2007. Emissions from gasoline evaporation were estimated using COPERT IV. The quantity of fuels used in agricultural transports and in national navigation was provided by NIS. The emission factors are those recommended by the guidebook. The activities regarding the national fishing were considered as 1.A.4.c.iii and the agriculture/forestry was included in 1.A.4.cii. Pentru informaţii suplimentare va rugăm consultaţi fişierul ataşat.